I am Adrian Cox. I’m originally from Seattle but I’ve lived half of my life so far in Asia. One day in 1998 I went into an extended silent meditation retreat. Through it, I had a vision that changed my life forever. 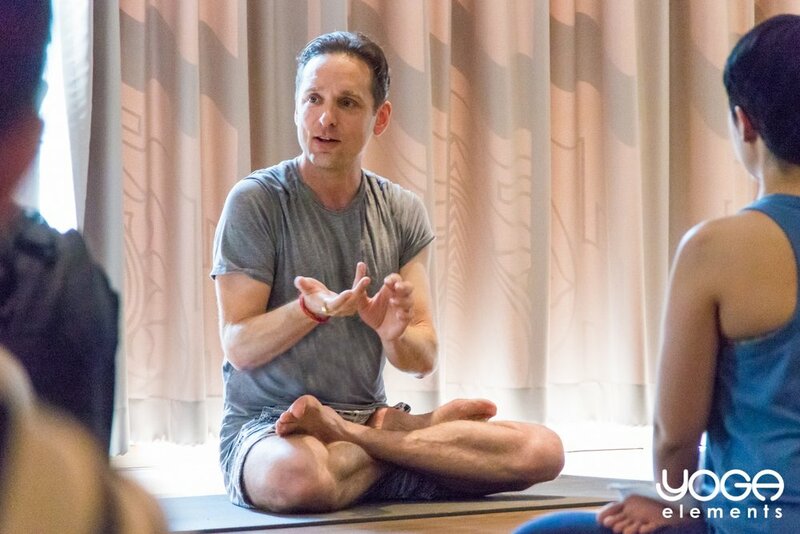 It was the clearest message I’ve ever received: I saw myself, teaching yoga in a studio that I was to create, in Bangkok Thailand. At that moment however, I was a computer engineer working in New York city. At that time, (and still now) yoga was very much my main interest in life, the place where I spent nearly all my waking hours was ‘OM Yoga’ on 14th street. It’s also where I first got certified to teach, although it is no longer there. Two years later in 2001, after long stays in the Bihar School of Yoga in India as well as living and study at the home of Dr. Yogi Vikashanand in Kathmandu, Yoga Elements studio was coming into form according to the vision I had. I remember one day, standing outside the building in we had rented the space in Bangkok, and it dawned on me that the building matched what was in the series of visions. It felt pretty wild thinking of all that had clicked into place at that moment. Nearly 20 years later, the school continues to thrive and even got recognized nicely along the way as one of the better ones to learn yoga at around the world. Learning, teaching and congruency could almost be my religion: I believe that the most powerful message I can send as a teacher is my own congruency and this drives me to practice and study, practice and study. In the service of learning how to teach more effectively, I have also become certified as a trainer of NLP and hypnotherapy with several of the world’s top trainers. During a recent period of deep personal crisis, I once again reignited my practice of ritual magick and combined it with my yoga practice as a means to focus my mind and heal. Ritual magick and the occult had been an interest of mine since I was a child although practicing it on a daily basis was not. At that point in my life, I needed something strong to get me back on track again. Magick is a powerful way to focus the mind and harness energy and it can start to make one’s life become more charmed. For me, where good advice, books, writing, meditation, psychologists, coaches, and healers had failed to make a big dent in healing my heart, the practice which came to me and what I now call ‘Pentagram Yoga’ really shifted things for me. Through this ritual, I found a renewed sense of clarity, purpose and a stronger sense of ‘Self’ than I have ever experienced before that. Pentagram Yoga is powerful magick and it feels physically and energetically amazing. It has become my mission to share this powerful work far and wide. If you feel drawn to this work, I invite you to connect with me wherever you are and discover what it is all about.